Surgeons are regarded as some of the most highly skilled members of the medical profession. We rely on them to do their jobs correctly and to take the necessary actions to fix our bodies. There is no room for error in surgery and when mistakes are made, they can have life-changing consequences for the victims. Our West Palm Beach surgical negligence attorneys have represented clients in many different types of surgical error cases. We understand the value of surgical error claims, and we know what it takes to secure the compensation you deserve. Our team obtained a $6 million verdict, including attorney’s fees and costs, for the loved ones of a mother who died as a result of surgical mismanagement of a urological procedure. Tragically, the nurses had incorrectly assembled the machine to be used during surgery. Instead of sucking in air, the machine blew out air. The surgeons, who had attended a three-day course to operate the machine, failed to recognize that they had filled the patient’s body with air, resulting in her death. With every case we take, we conduct a thorough investigation to determine the nature of the surgical error that caused your injuries and who was responsible. We work hard to see that all negligent parties are held accountable for the harm that you have suffered and that the wrong that has been done to you never happens again. $1.6 million – Medical Malpractice – A settlement against an orthopedic surgeon as a result of mismanagement of an operation, which resulted in the below-knee amputation of a 36-year-old lawn maintenance supervisor. The surgeon failed to recognize that the circulation was cut off, and ignored the nurses’ consistent warnings. 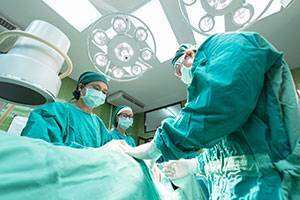 Our West Palm Beach surgical negligence lawyers have successfully represented clients in many different types of surgical error cases. Contact us today. You can reach us at (561) 684-2500, toll free at 1-888-666-0523 or online.